One autumn, I decided I would follow an experienced gardener's formula for reviving flower borders. Actually, her garden was more like a field of flowers, a giant cottage garden that must have covered four acres. She and her English-born husband worked day in and day out all year long to encourage re-seeding annuals and to ensure the health and life span of scores of perennials. At the time, I had two struggling flower borders, each backed by a newish hemlock hedge and outlined by dwarf English boxwoods, the latter only a few inches tall. The beds were not very wide, but could hold two to three rows of flowers. The borders were on two sides of a rectangular lawn surrounded by the evergreens. On one side I had my favorite combination ever - a green and white variegated hydrangea next to pinkish-red rubrum lilies, white garden phlox 'Mt. Fuji', and yellow black-eyed Susans. At that time, before the seasons got moved backwards (meaning earlier flowering), the peak bloom for this combination was mid-July. I enjoyed this mix of flowers and foliage for a few years before the blooms became more and more sparse. That's when I finally tried out the formula my guru and her husband used in their giant garden. After the first killing frost, I cut back everything except the hydrangea. Then, I put down a layer of composted manure which I got from my daddy's barn; next, I sprinkled granulated trisuperphosphate over the the manure. The last and thickest layer was finely ground up pine bark (the brand was Nature's Helper). During the winter, this was not a pretty sight - just brown earth. But, the next summer, there was an explosion of flowers. In July, the garden phlox had never had such large flower heads. The rubrum lilies seemed to have multiplied, and the variegation on the hydrangea was pure white and vivid green. The black-eyed Susans were bigger and better than ever. It was like the Galapagos Islands had come to my garden. But there was a downside to this. In June, invasive yellow primroses had spread like mad, although I loved the pale lemon color. The mistake I had made was jumping on the 'Stella d'Oro' daylily bandwagon. I had scads of them down at the end of both borders. The color seemed to go with nothing, and after the first flush of bloom, the foliage of this supposedly miraculous re-blooming dwarf daylily looked ragged and unkempt. In addition, they appeared particularly harsh next to light blue Stokes asters and the now over-sized purple coneflowers. I also had some red Asiatic lilies mixed in there, and it almost hurt your eyes to look down at this over-flowing border that was just plain garish. Still, I reveled in the scene once that July combination came into bloom. There were no digital cameras then, and I think somewhere I must have a slide of this very pleasing blend of flowers and foliage. I thought if I kept up the formula my friend had recommended that the border would go on forever. The next spring, a giant pine tree died and had to be taken down. The rogue tree cutters paid no attention to me, out there wringing my hands. They dropped the main trunk right onto my July border, crushing the box border and two hemlocks. That huge tree, which looked like it belonged on a logging truck, lay there for two seasons. When it was finally removed, there was no sign of a rubrum lily. I had two or three moldy stalks of white phlox and some struggling black-eyed Susans. I never saw the hydrangea again. I dug up the Stellas and gave them to a nurseryman. I just couldn't get used to that color. 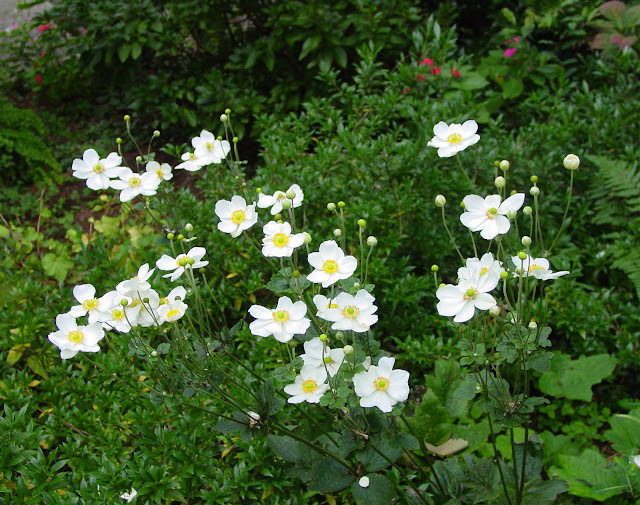 Across the rectangle, I had a few blue platycodons in August and some white Japanese anemones in September. At some point, even those disappeared. Today, the rectangular zoysia lawn that was to be a bocce ball court has been replaced with a sea of tiny pea gravel. The dwarf boxwoods are probably three feet tall and grow right up to the hemlocks. There's not even an inch of space for a flower where the borders used to be. When I look back at everything I have planted over the decades, it amazes me how many different things I have tried. Some (mostly perennials) I had for years. Others for just a season - or even less. Sometimes a friend I had long ago but have lost touch with will pop into mind. It's sort of like that with flowers, too - 'Becky' daisies, Monarda 'Jacob Cline', Japanese anemone 'Whirlwind,' 'Sarah Bernhardt' peonies, Salvia guaranitica, blue baptisia, Helianthus angustifolius (I had a dog who ate that!) - just to name a few (I won't even mention the shrubs and vines I used to have). They were in my life for a while, then one by one were gone. There might be a day in the future when I will have some of these flowers again. I hope so. I took the above photograph of Phlox paniculata 'David' when I visited a friend in Montana. She and her husband have since sold the house and are back in Nashville. I don't know if that border is still there. Things change - people move, deer come into the area, drought takes its toll. But, the good thing about gardening is there is always another day. I'm not sure where or how it will happen, but I intend to create that rubrum lily, white phlox, variegated hydrangea and black-eyed Susan combination again. 'Stella d'Oro' won't be back - that's for sure - but maybe many of my other "lost" friends will.